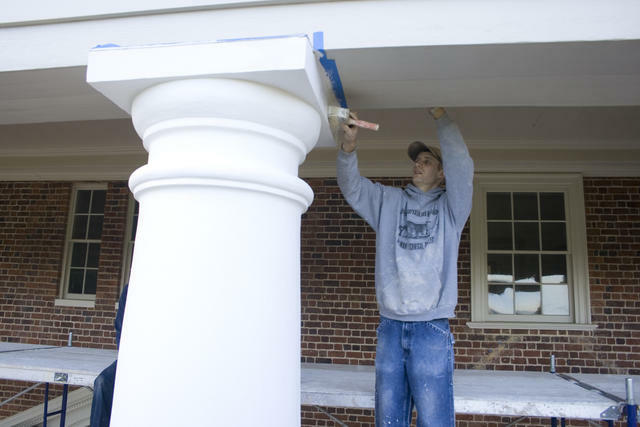 To whitewash the columns the masons at Montpelier used wide, course whitewashing brushes that were similar to the brushes used in Madison’s time. Traditionally whitewash is made from lime putty mixed with water. Often other ingredients, such as sour milk, salt, alum, linseed oil, beer and even urine, were often added to traditional whitewashes in hopes of making the paint last longer. However the whitewash used on Montpelier's columns only contained lime and water. Robbie Kolb whitewashing a column with a traditional whitewashing brush.